All commercial washrooms need to provide means for people to dry their hands, and Envirotec Hygiene Services are trusted providers of commercial toilet roll dispensers and commercial paper towel dispensers. Serving customers throughout Nottingham, Sheffield and Leeds, we deliver toilet paper holders and paper towel holders as well as the paper and towels themselves, ensuring your washroom is fully equipped for the needs of your staff, customers and guests. 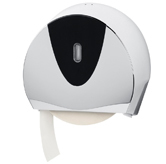 With toilet roll dispensers available in small, medium or jumbo sizes and with the option of one or two reserve rolls, our toilet paper dispensers are ideal for any business. Our paper towel dispensers can dispense paper towels of any size, too. For more information about our toilet roll and paper towel services, please feel free to get in touch with us today and we will be more than happy to help you with anything you need. Our toilet roll dispensers are available in mini, standard or jumbo sizes with single or twin reserve roll options. So you can be sure we supply dispensers for any type of washroom. We have a wide range of hand towel dispensers that can dispense any size or fold of paper towel – call us to discuss your specific requirements today!